Christine Davis' 8/29/2007 email to Judge Nicole MacInnes). English community phone book that was endorsed by U. S.
Senator Patty Murray and Gov. Mike Lowrry in 1994 (see left). 1. Mr. Cheng is a loyal Christian who likes to help people. 2. Mr. Cheng is a "true gentle man and a scholar" who does not take woman's advantage. 3. Mr. Cheng is "a man of honest", "a man with devotes to his family, love his church, and cares about others." 4. Mr. Cheng is "a man of the best character and would never jeopardize his desire to help heal people." 5. Mr. Cheng is "a very caring person" who treated his patient "with the utmost respect." to remove any clothing or was never made to feel uncomfortable any way and especially not in any sexual way ever." sessions, the young female patient "was always clothed," and she "was never touched inappropriately"
8. Even the State's witness, Bonnie Carlson, was appreciated with Mr. Cheng's professional service (infra). 9. Mr. Cheng's medical massage ("Acuvibra" technique) does not allow the client to take clothes off. 10. No one complain of Mr. Cheng because they felt safe with his professionalism. controversies in order to influence the resolution of the issues involved." 12. 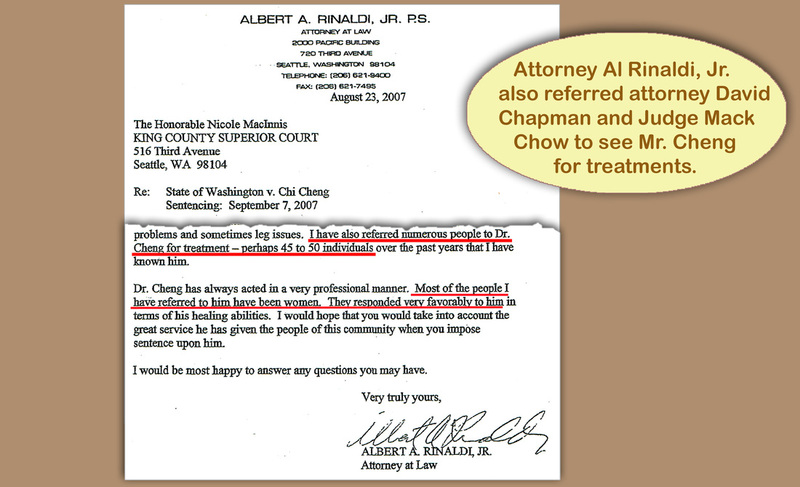 The next day, on 6/5/2007, The Woman told the jury that Mr. Cheng "is like a healing force" in her life. See King Count Superior Court's 6/5/2007 transcript (No. 06-1-05678-3), page 25, lines 24-25 . During the appeal, Lenell Nussbaum, the top appearing attorney in the State of Washington wrote: "You are an innocent man wrongfully caught up in the craziness and deceipt of these two women..." (see bellow).